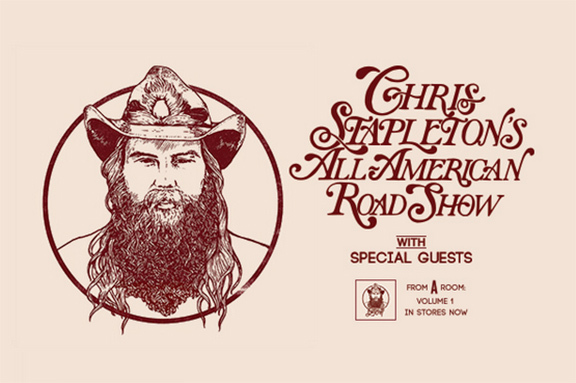 Chris Stapleton’s All American Road Show with special guests Marty Stuart and Brent Cobb are coming soon to the Coastal Credit Union Music Park at Walnut Creek in Raleigh, North Carolina -Friday October 12th. Christopher Alvin Stapleton, (born April 15, 1978), is an American singer-songwriter, guitarist, and record producer. He was born in Lexington, Kentucky, and grew up in Staffordsville, Kentucky, until moving to Nashville, Tennessee, in 2001 to pursue his dream career in music writing songs. Four days after his arrival in Nashville, Stapleton signed a contract with Sea Gayle Music to write and publish his music. As of 2018 Stapleton has amassed credits writing and co-writing over 170 songs. He has co-written six number-one country songs including Kenny Chesney’s five-week number-one “Never Wanted Nothing More”, George Strait’s “Love’s Gonna Make It Alright”, and Luke Bryan’s “Drink a Beer”. His songs have appeared on many artists albums including Adele, Brad Paisley, and Dierks Bentley. He has co-written with several artists as well including Vince Gill, Peter Frampton, and Sheryl Crow. Stapleton has been recognized with several awards including five Grammy Awards, seven Academy of Country Music (ACM) Awards, and seven Country Music Association (CMA) Awards.